The all-new CR7 Mercurial Lite Shin Guards offer ultra-lightweight protection with a low profile that is sure to turn heads. Featuring an anatomical fit and striking new semi-transparent shell, these guards are made for performance and style. 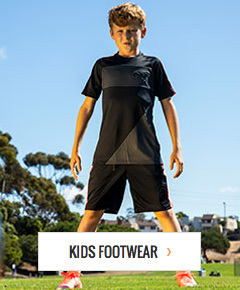 Nike shin guard sizes are determined by height. Match your height to the chart below to find your correct shin guard size. The bigger the shin guard size, the longer and wider it is to accommodate larger leg diameters. Shin guards should fit from just above the bend of your ankle when you flex upward to a couple inches below the knee. XS/TP 4' 7" - 4' 11"
S/P 4' 11" - 5' 3"
M/M 5' 3" - 5' 7"
L/G 5' 7" - 5' 11"
XL/TG 5' 11" - 6' 3"
Created with an anatomical fit, the left and right guards are individually contoured with an EVA foam backing and Dri-Fit guard sleeves. The EVA Foam backing molds to your shin while the Dri-Fit sleeves secure the guard and wick away moisture. The Dri-Fit sleeves also provide compression to help circulation and prevent fatigue and cramping. These CR7 Mercurial Lite shin guards also feature a semi-transparent finish that reveals the inner structure and bold Nike graphic so they look as good as they perform. With the perfect amount of flair, these guards got you covered. Catch Cristiano Ronaldo wearing the Mercurial Lite Shin Guard this season with Portugal and Real Madrid. Play with confidence and protect yourself this season while you leave defenders in your dust. Play faster, smarter, and longer like Cristiano and elevate your game to the next level with elite level equipment designed for the best athletes in the world.